Artist Huong Thanh, an overseas Vietnamese in France, has recently been awarded a traditional music by France Musique which has followed this Vietnamese native artist’s art road for 10 years now. France Musique is planning to record a CD full of <?xml:namespace prefix = st1 ns = "urn:schemas-microsoft-com:office:smarttags" />Vietnam’s folklore and reformed theater (cai luong) sung by Huong Thanh, and then produce, issue and distribute it. The Vietnamese, who love folklore and reformed theater songs, remember artist Huu Phuoc who shared fame with other artists Thanh Duoc, Ut Tra on and Bay Bain their times. Huong Thanh is his daughter. Reformed theater songs were impregnated with Thanh’s soul from her observation of her father’s performances every night when she was a child. At the age of 17, Huong Thanh and her parents left Vietnam for France. “At that time, I cried so much”, Thanh confided, “I thought my dream of performing on stages had turned to dust”. With a passion for singing, however, father Huu Phuoc and daughter Huong Thanh were determined to follow their chosen fate and lure new audiences. 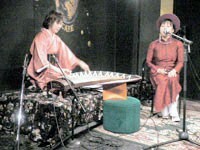 They performed nightly in a Vietnamese restaurant in Paris. Unfortunately, success did not last long. The fewer people who came to the restaurant, the less performances there were. In the 90s, they had only one show when Vietnamese Association in France celebrated Tet holidays. A meeting with Nguyen Le, a guitarist sof Vietnamese native, who is very famous in the jazz community in Europe was a turning-point in her career. Nguyen Le blew a fresh wind into Huong Thanh’s songs, and that attracted more European audiences. Since then, Huong Thanh has tirelessly found new flavors for her songs. Late May, for the first time, koto, a musical instrument from Japan, accompanying with Vietnam’s folklore songs was played by Mieko Miyazaki and Huong Thanh brought audiences in Paris into a new world. They had a chance to go through three regions of Vietnam and to the country of cherry blossoms. Not only Vietnamese were moved by such folk-songs, the French too, who said that although they did not understand the theme they were charmed by the friendly and flexible show between Vietnamese and Japanese artists. Ms Virginie said: “I know the koto instrument but this is the first time I hear Vietnamese folk-song. I seem to live in another world when I attend such a performance”. The melody of Vietnamese traditional folk-song is much different to European music. So that Huong Thanh regularly changes her partner in each show to step by step win the audience’s hearts. Besides sharing the feeling to the overseas Vietnamese audience, she longs to introduce the proud beauty of Vietnamese traditional culture to international friends. She has traveled to perform for overseas Vietnamese in Mexico, the UK, Germany, Italy and SNG countries. Huong Thanh has made three albums on Vietnam’s folklore songs played with other countries’ musical instruments so far, namely Tales from Vietnam; one river, two streams; and moon and wind. She is sometimes ranked second in the World Music group in Europe.